Decorating a little one's room can be so much fun! And can be so expensive! But it doesn't have to be! I took a look around and a Teddy Bear Bookend can cost you as much as $295.00 EACH! 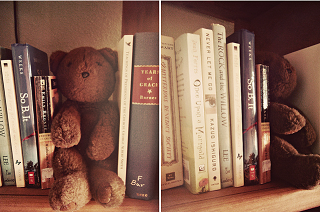 Did you know... you can make your own matching stuffed toy book-ends out of your own adorable stuffed animals? Simply undo the back of your stuffed toy, take out some of the stuffing and fill with marbles for weight. Re-sew the back opening by hand. To prevent sliding, glue a non-slip rubber /silicone mesh pad on the bottom of the stuffed toy. This works great for matching the decor in your baby's room.